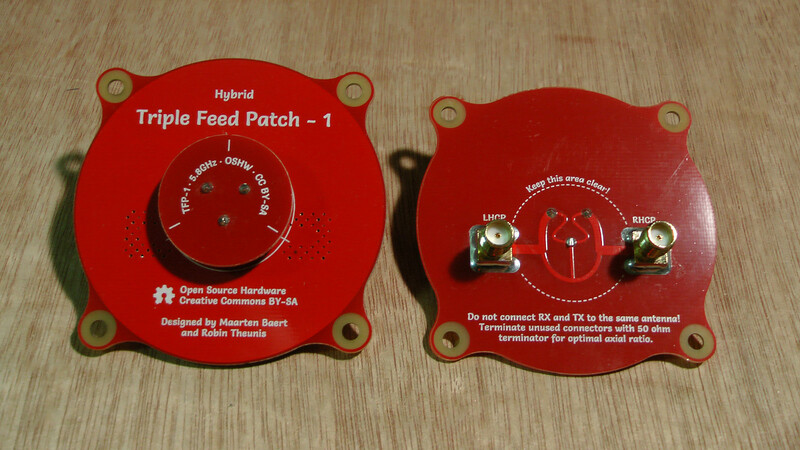 Photo of a Triple Feed Patch 1 prototype. This is the 'hybrid' variant, which is simultaneously LHCP and RHCP, with a different connector for each polarization. There is a regular single-connector LHCP/RHCP variant as well. Special thanks to Antenna Test Lab who were kind enough to provide complete spherical anechoic chamber measurements (i.e. 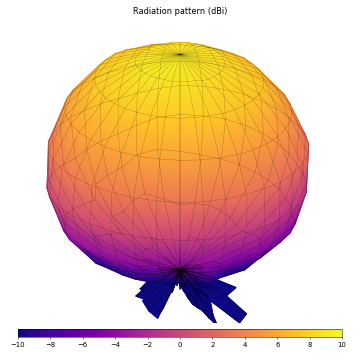 3D radiation patterns) for the Triple Feed Patch antenna. You can find a detailed test report of the Triple Feed Patch antenna on their website. Includes semi-rigid coax (SMA male – SMA male or SMA male – RP-SMA female). Only ships to the Czech Republic and Slovakia. Includes semi-rigid coax (SMA male – SMA male). The second PCB (pcb_tfp_1_part2_*.zip) has a separate file for non-plated-through holes (pcb_tfp_1_part2_*-npth.txt). PCBs: Manufacturers will make these for you if you send them the Gerber files which are included in the design files above. 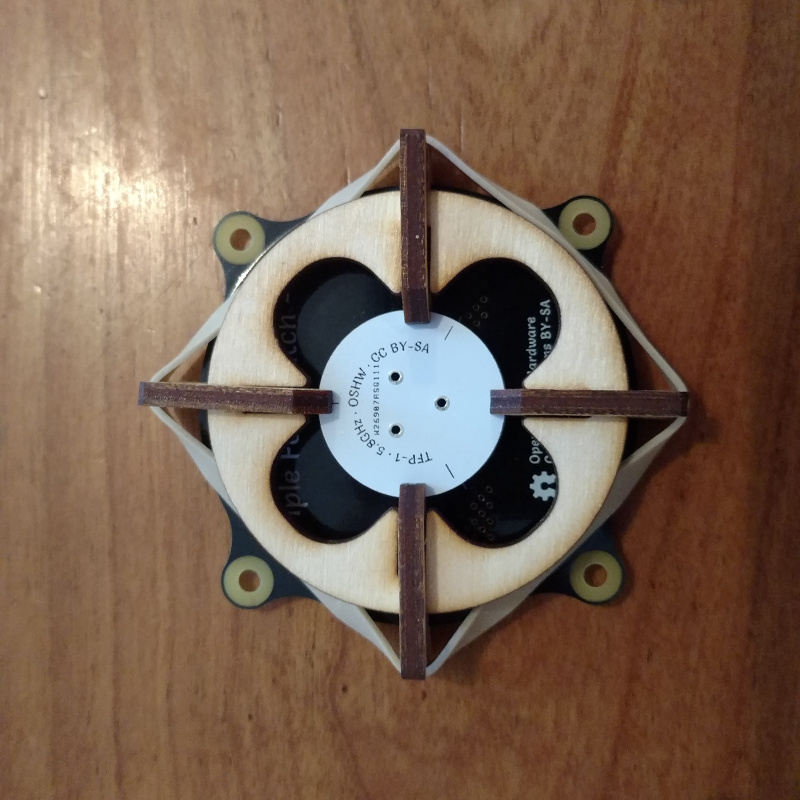 I used Elecrow for my prototypes, they will make 10 PCBs for $10. That means you end up paying $2 per antenna (it gets much cheaper if you make them in larger quantities). The PCBs must use 1.0 mm thickness FR4 material, not the regular 1.6 mm thickness. The correct thickness is critical, if you get this wrong the design won't work properly at all! Regarding copper thickness, 35 µm (1 oz) is fine. Thicker copper tracks won't improve the efficiency at RF frequencies due to the skin effect. The design is tuned for standard FR4, but there may be small variations between different FR4 manufacturers which can result in a shift in the center frequency of the antenna. I specifically made sure that the design isn't too sensitive to material variations, so this shouldn't be a huge problem, but you should still avoid manufacturers that use special materials with different dielectric constants than regular FR4. Copper wire: Regular copper wire with a 1.0 mm diameter is used to create the three feed pins. Tin-plated copper or similar is also fine, but don't use iron or steel wire. SMA connector (vertical type): For performance reasons I used surface-mount vertical SMA connectors. I used this for my prototypes. They cost $8 for 10 pieces, so that's $1.6 per antenna. Soldering these requires a hot air rework station or reflow oven, because you can't reach the center pin with a regular soldering iron. 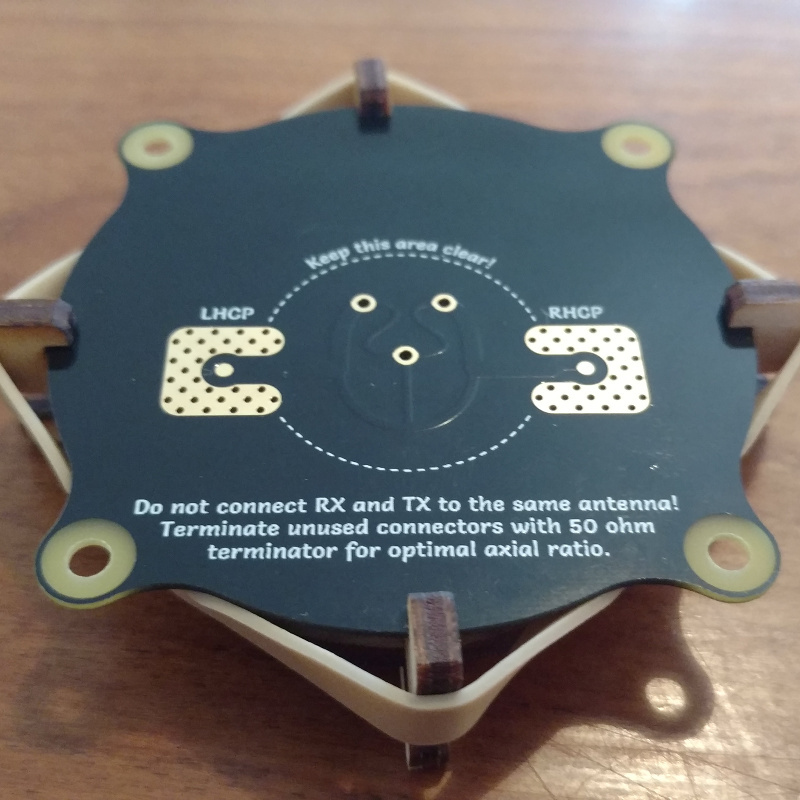 I'm planning to make some variants with simpler edge-mount connectors that are easier to solder, but this will result in longer tracks over FR4 which means higher loss. SMA connector (edge mount type): The advantage of the edge mount type is that you don't need a hot air rework station or reflow oven. This type of connector is also somewhat less likely to break. The disadvantage is that you need slightly longer PCB tracks, which results in higher loss. You can buy these connectors from many sources (example), but make sure that you get a type made for 1.0 mm PCBs, not the default 1.6 mm! Typically these connectors will have a pin spacing of 1.1 – 1.2 mm to accommodate small manufacturing variations. The PCBs need to be spaced accurately to get good results. The correct spacing is 4 mm. You can buy metal spacers of this height to make this easier. Ideally you need to get these distances right within a 0.1 mm tolerance. 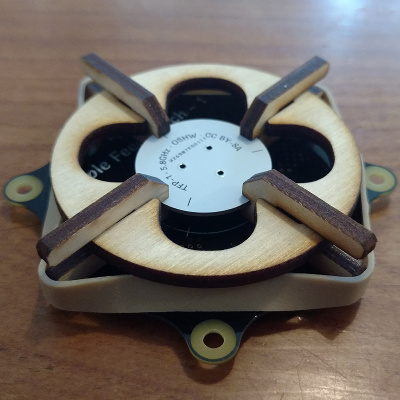 David Lewis (FarVew) created a nice laser-cut assembly jig which is especially useful if you want to assemble several of these antennas. It's not strictly required though, you can also assemble the antenna without this, it just takes longer. Just want to try to make it with my self. I am hobbyist, not a manufacturer. I want to order PCBs at elecrow.com and have some additional questions (what I didn't found at your instruction). They ask a lot of things what I didn't understand what this mean. PCB Size: What size I need to tell them? At least for price calculation they ask it. I didn't found it in your description. Surface Finish: Hasl Lead Free? it is michael from RJXHOBBY, we are manufacture, we would like to pick up this design, just to confirm, need we get authorization from you to design and sell this, thanks, your quick reply will be highly appreciated. - Copper Weight: "1oz 35um"
- PCB Stencil: "No Stencil"
- Panelizing: "Single PCB with milling"
Can you tell what better wire to get (to connect Patch with goggles). Or you made it by yourself as well ? thanks for your answer, i really appreciate it. I used the same coax as what I used for the Pagoda antenna and attached the connectors myself. It's RG402 and corresponding soldered SMA connectors. Ebay links here and here. I'm not sure if you have a section yet for a list of retailers, or plan too. If so, I was wondering if my store could be added? We have a preorder and expect stock to be received with a week-ish. Maarten? Will it not affect the functionality of the antenna? Tomkanovik, Use it as spacer wile weld. Thanks again to release wonderful new gadget to the community! Anyone interested to sell the raw PCBs by units for Europe: I m not really up for 10 pieces. we have made this triple feed patch antenna already. Hello. Awesome antenna! Do i assume correctly due to the name, I can actually use this antenna as LHCP and RHCP in 2xMiMO? Thanks Michael: I just ordered one of them. Eager to test them. I will post a short review once tested. It will definitely shift the center frequency. I don't recommend using any spacer, it's really not necessary in my experience. If you really want a spacer, use something with a very low dielectric constant and very low loss, like Styrofoam. Yes, if you have a receiver with MIMO support. It would be great if you can support us. Hope we can make more cooperation in the future. Hello Maarten, do you think a PCB with 0.8mm with 0.5 oz of cooper will be a problem? contact michael for dealers price. thanks again for wonderful design. other question, the top pcb has to be 2 layers also? Yes. This design is made for 1mm FR4 and will not work properly with anything else. Not strictly required, but for physical strength it helps a lot to have solder pads on both sides. Far Vew finally got their version up and on! They include an extension with either SMA or RP-SMA and also include a 50ohm dummy load. Thanks Maarten you and Robin have reshaped FPV again! Thank you very musch for the answer, I'm doing a prototype in home with the right board and I also ask to elecrow some pieces. Hi, when using triple feed patch antenna, do I still have to use diversity module? Or if I'll use diversity module, which can I pair with triple feed patch antenna? Hi! I'd like buy this great designed antenna. But have a question: can I use a cheap 50 ohm SMA dummy load from ebay or aliexpress. My biggest problem is this dummy loads specified only 3 GHz. When you mention using the surface mount SMC connectors for performance reasons, what kind of performance degradation would you expect if you used the PCB mount connectors with longer legs? - remove from pcb feeder line from LHCP side ? Typically directional antennas like these are combined with an omnidirectional antenna (like the Pagoda) in a diversity setup. You can use them without diversity if you want, but then you need to make sure that you are always pointing the antenna in the right direction. Any diversity module should work with any antenna, as long as the connectors are compatible. Any 50 ohm terminator should work, it's not critical. 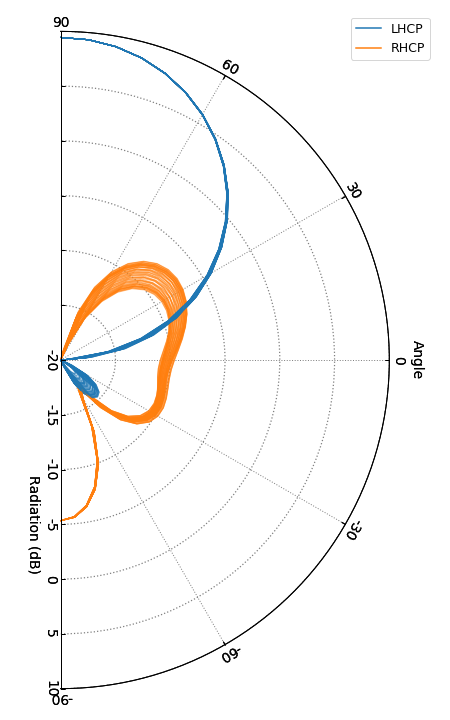 You can even use the antenna without a terminator, it will still work fine, the axial ratio will just be slightly worse because the opposite polarization will be reflected instead of absorbed. The problem is that the through-hole connectors would need a hole in the ground plane, which interferes with the patch antenna on the other side. It's also really difficult to get a good 50 ohm match with those connectors at high frequencies. 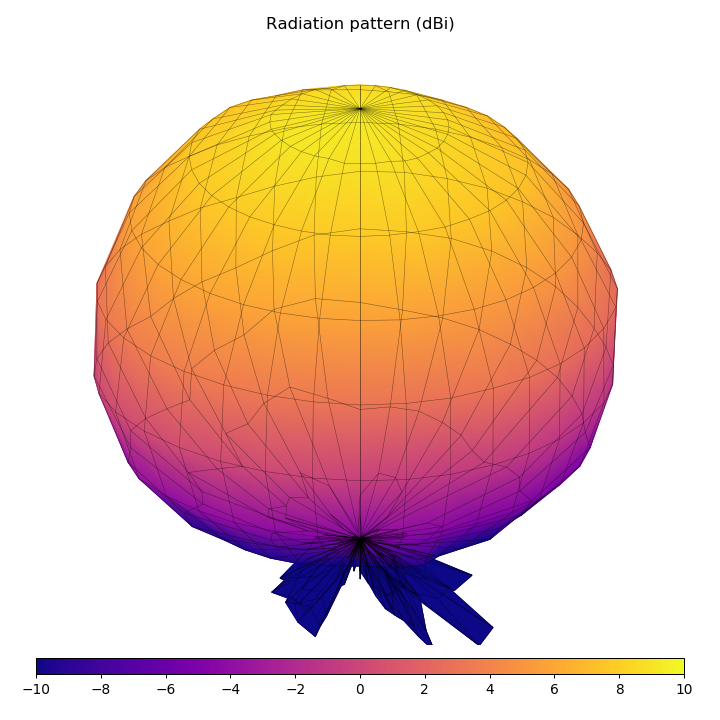 If you point the patch straight at the other antenna, that's considered 0 degrees (the top of the radiation pattern graph). These aren't necessarily better than crosshairs, but they are easier to manufacture because they aren't as sensitive to deviations in length of the radiating elements. 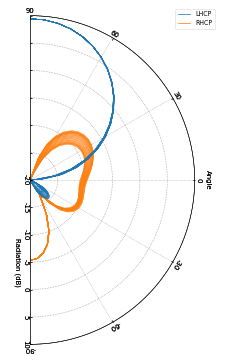 Also, this antenna achieves a good axial ratio across the entire bandwidth, whereas crosshairs typically only get a good axial ratio close to their center frequency. Finally, this antenna has a good axial ratio in all directions, not just when it is pointed straight at the other antenna but also at an angle. This is rarely the case for rectangular patches or crosshair antennas. Conductivity is irrelevant in this context, what matters is dielectric constant and loss tangent. The dielectric constant of air is 1.0, for plastic it is usually somewhere between 2.0 and 3.0 depending on the type and density. The resonance frequency of a patch is inversely proportional to the square root of the dielectric constant. This is basic antenna theory which you can find in any book that discusses patch antennas. For example, if you used a polyethylene spacer (dielectric constant 2.26), you will shift the resonant frequency from 5.8 GHz down to 3.86 GHz. Of course the feed network isn't affected by this since it is on the other side of the PCB. So you now have an antenna with a 5.8 GHz feed network and a 3.86 GHz patch, so your antenna will be pretty much useless. The Pagoda was less susceptible to this because the space between the plates contains only a small part of the electromagnetic fields. As a result you could put a spacer between the two and still get an antenna that was usable. This is not the case for patch antennas, where 99% of the electromagnetic field is concentrated between the two plates. Option 3, but if you don't want to add the SMA connector, you could also solder a 50 ohm SMD resistor directly to the PCB. Removing the connector is also possible, but don't remove the feed line. The feed network in the center has been designed with the feed line taken into account, removing it will affect the performance. An even better option is to use an alternative feeding network that is LHCP or RHCP only, but I haven't made that one public yet because I didn't have time. 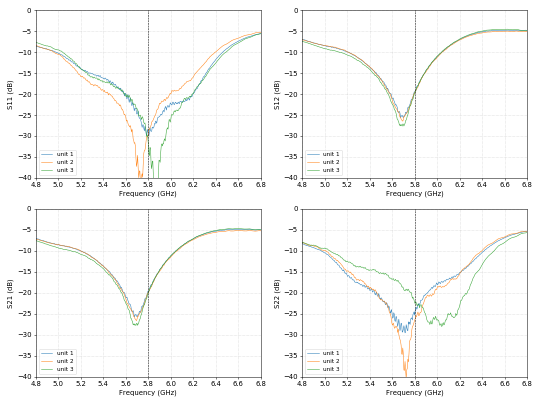 What is center frequency? I run my vtx on channel 5658. Am I off center? Is center as close to 5800 as possible? Does it matter how the patch sits on the goggles ? Is there a up or down/top or bottom of the patch? The center frequency is 5.8 GHz. As you can see in the specs, the bandwidth is 660 MHz (5.47 – 6.13 GHz), so 5.658 GHz will work fine. There is no top/bottom, just point the patch in the direction of the transmitter and you are fine. That won't work well with the current PCB layout. The matching will be bad. The layout you see now is specifically tuned to match well to those vertical SMA connectors. I am ordering from Seeed, there the PCB size can be much smaller - from the .dxf files I see part one is 24.9mm wide, and part 2 is 60.0mm wide - any reason not to use these sizes in the order page? Also, neither Elecrow or Seeed provide the Panalizing option in the web form - any idea what will happen if this is not included in the order? I should get in contact with them for a personal quote? PD do you have a paypal or accept bitcoin (better some other vcoin with todays tx rates! ), even thou you offer these open source, I really think you deserve some renumeration for your excellent work! - SMA and RP-SMA - Includes semi-rigid coax (SMA male – SMA male or SMA male - RP-SMA female). Notes: Each antenna is measured individually and gets its own parameters tab. SMA and RP-SMA - Includes semi-rigid coax (SMA male – SMA male or SMA male - RP-SMA female). Fast delivery in the EU (3-10 days). Since male SMA terminators are hard to find can I use a 49.9ohm resistor to terminate one of the sides permanently? I plan to remove the SMA connector and just solder an SMD resistor between signal and ground in the place of the old connector. If the manufacturer asks for the exact size, then you should do that. Elecrow doesn't do this though. If they don't offer panelization, then don't worry about it. Also, I don't accept donations, but thanks anyway :). You should just get the LHCP or RHCP variant instead of the hybrid if that is what you want. But yes, you can do this. It won't be perfect because the footprint is designed to cancel out some of the mismatch of the connector, but it will be pretty close. We also have the triple feed patch antenna available on our store. Could you add our store to the table as well? Can you specify which connectors you are using on the PCB as well as the coax? Is the PCB connector also RP-SMA or just one of the connectors on the coax? Yes, sorry for the long response time, we make the plate exactly the way you do for the connectors, but the coax can be made for either an SMA or RPSMA receiver. Can I remove the 4 holes on this without affecting the performance? The mounting holes have no impact on performance. Changing the diameter has a small effect on the directivity, but 2.5mm won't make a significant difference. On the antenna it says, "Keep this area clear". For my setup it's easiest if I use a right angle adapter and send the cable out the side. Is that going to cause problems? No, as long as you keep the cable and connector at least 1 cm away from the tracks it's not going to have an impact. I was curious if you had any success with 2,45 Ghz design? The CubeSat communication in S-band 1.98-2.02 GHz and 2.17-2.2 GHz would greatly benefit from an affordable antenna design. I don't have enough time to redesign this antenna for all possible frequencies. But it shouldn't be too hard to do this yourself, especially if you use the simpler one-port feed network instead of the hybrid LHCP/RHCP version. On the vertical cross-section image it looks like as the LHCP is more "stronger" as the RHCP polarization? 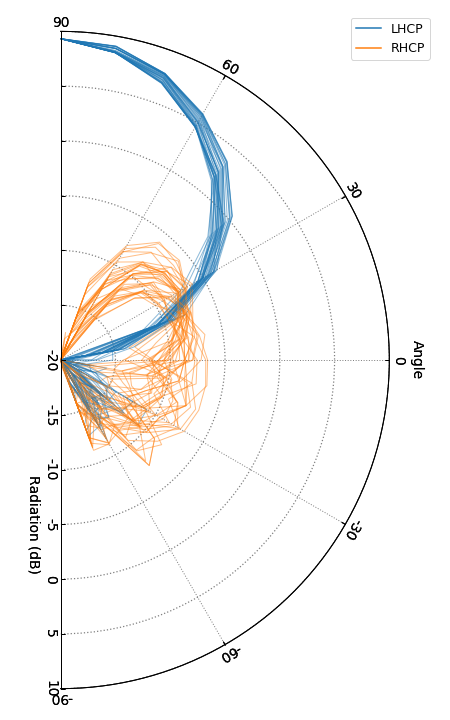 The LHCP polarization looks like an big signal bubble in on direction and the RHCP much smaller. 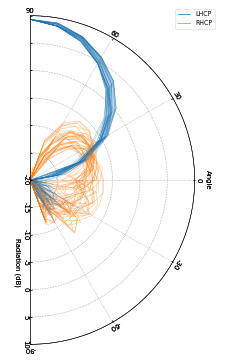 Or are the two polarizations equally strong? The images show the radiation pattern when a signal is applied to the LHCP port and the RHCP port has only a 50 ohm terminator connected to it. It's not supposed to transmit any RHCP radiation. If you swap the signal to the other port, LHCP and RHCP will be swapped as well. So LHCP and RHCP are equally strong, at least when using the right port. First of all, thank you for your great work Maarten! 1) would it be problematic if i connect the antenna directly to a 45° angle adapter on my receiver without the coax cable? 2) is the antenna supposed to be oriented in a specific manner (like one site has to be towards the sky and the other to the ground) or does it only has to be pointed toward the transmitting antenna no matter the rest of the orientation? 1) This is fine. Just keep enough distance between the receiver and the tracks on the PCB. Ideally 1cm or more. 2) It doesn't matter as long as you point it at the transmitter. Interesting and quite simple design! Thank you for your hard work! 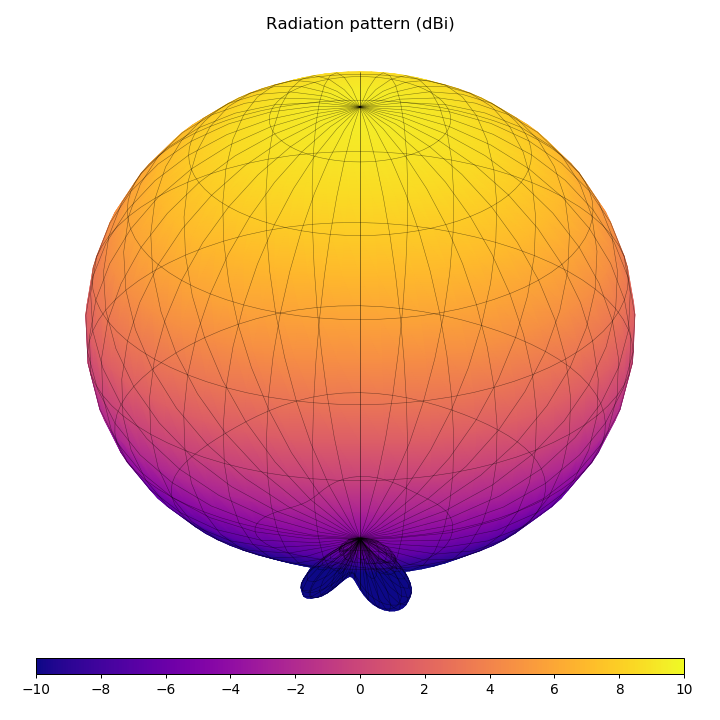 You've made awesome antennas! I have made several pieces of RHCP version of triple feed patch antenna. I have made sure the PCB spec is correct as you have stated in the instruction. I order the PCBs from Seeedstudio. Also, I solder the antennas with the Farvew's jigs. 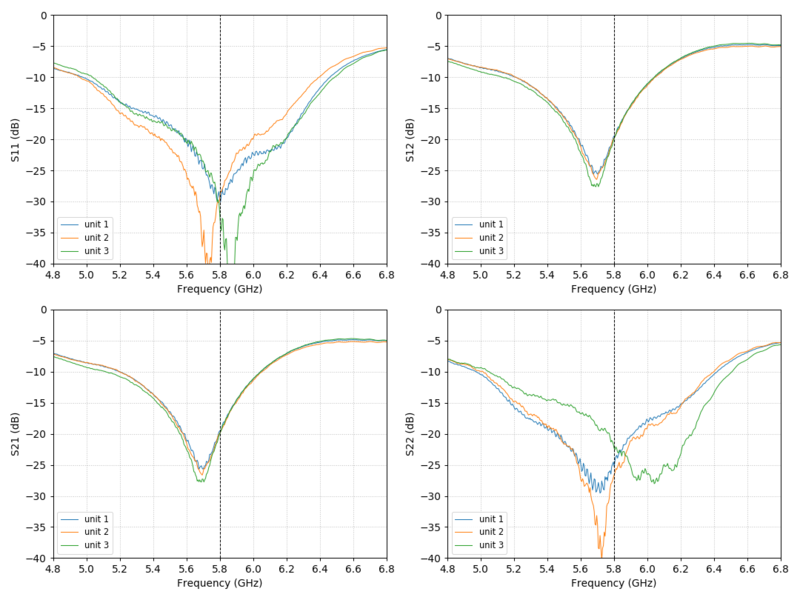 However, all of the antenna I make, center frequency is consistently at around 5.2-5.3 GHz. At 5.8 GHz, the S11 is around 19-14 dB. What would you suggest? Decrease the patch spacing? Yes, this is possible, but you will have to re-simulate the feed network, which is quite tricky. Just scaling it by a fixed factor won't be very accurate, especially for the hybrid variant. Yes, decreasing the space between the PCBs will increase the center frequency. Your jig may be inaccurate, maybe the spacing is already too high. Try measuring it with calipers. If that doesn't explain it, perhaps the manufacturer has switched to a different brand of FR4. Thank you Maarten for your reply. Another related question, if I decrease the patch spacing in order to get higher center frequency, but how does it affect other performance parameters, such as axial ratio, radiation pattern, etc? Will they be compromized? I don't think they will change significantly. The axial ratio is determined mostly by the feed network. Of course if you try to use the feed network at a frequency significantly different from what it was designed for, then it may not work as well.